Where I live, we don’t have balls (the party kind) which I suspect is probably a consequence of living in a town of rather poor/cheap people. Not that I would go to one anyway as its really not my thing and there is little I hate more than dressing up no matter how good I look when I do. However, I could be persuaded to go to one if I had a date that was wearing a TARDIS ballgown like the one below! 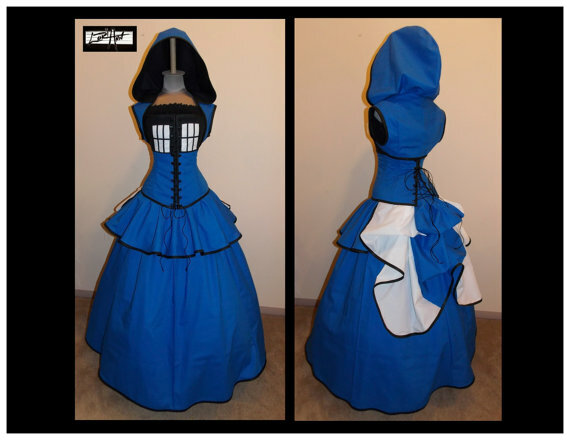 Etsy seller loriann37 is selling this fantastic hooded TARDIS ballgown for $474.99. This ballgown will be made to whatever measurements you happen to be and is made up of six pieces (front and back tie over-bust corset, aong a-line skirt w/trim, full circle mini skirt with trim, mid length add-a-bustle with trim – drawstring waist, hoodie bolero shrug, sleeveless black top w/lace). If you are a lady that loves Doctor Who and has a ball to attend but nothing to wear, I’d say this TARDIS ballgown is for you! If you do go to a ball in a TARDIS gown, I want to see pictures so hit me up via the contact page linked at the top.